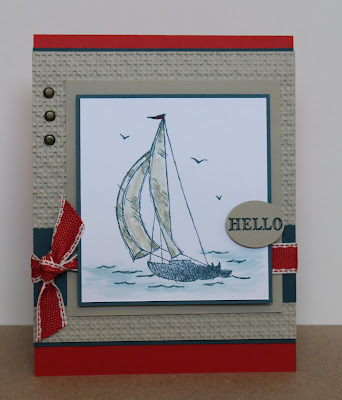 Just Julie B's Stampin' Space: Sailing into Thursday! So this is a card I made for the Create with Connie and Mary Color Challenge 150. It was definitely a challenge when I saw the colors Poppy Parade, Sahara Sand and Not Quite Navy. I've been wanting to use the Poppy Parade, but every time I think to take it out I find something else. I guess it's just not one of those colors I'm drawn to. 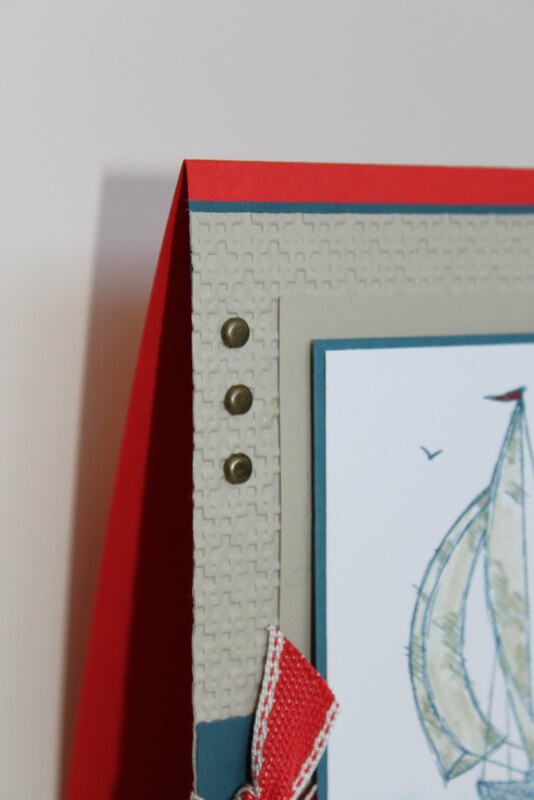 But when I put these three colors together, I got a masculine and nautical feel. 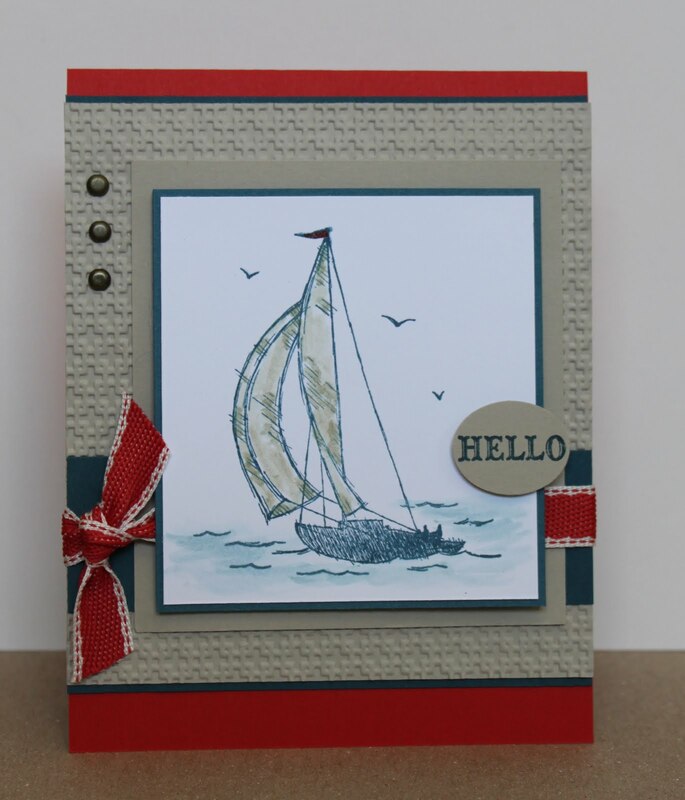 So I decided to use the Sail Away stamp. Here's a close-up of the Poppy Parade Poly Stitched Twill. I love this ribbon - it's so nice to work with! It's soft, but makes a nice crisp knot! And to color-in the Sail and the water, I used the Aquapainter with Sahara Sand ink and Not Quite Navy ink. And finally, because it was a masculine card, I couldn't add bling, but the antique-brass colored brads added that little something I thought it needed! And I think once this card was all put together, it gave a Ralph Lauren Polo feel!? Love this card and its clean and simple style. Colors are great. I am just about convinced to get that stamp. Love the clean lines of this card and your added touches (like the antique brads) definitely kept it masculine. Great card!! I like how the Square Lattice makes everything else stand out. Great card! Thanks for playing with us this week at Create with Connie & Mary! Your card is just wonderful! I love your layout and the way it all works so well together! Beautiful! Thanks for playing the challenge at Create with Connie and Mary! Julie this is just lovely. I love how you've designed this card with all the little details. Thanks for playing at CCMC this week. GORGEOUS...just GORGEOUS!!! I love all the details on this! Thanks for playing along this week in the Create with Connie and Mary Thursday Challenge! LOVE it! Love everything about it! Put it in my favorites! Thanks for playing the Create with Connie & Mary Challenge!